Oakley has released the all-new Front Line MX goggle as the latest addition to their high impact line of motocross goggles with a list of high-end features throughout. Using a new rimless frame design, the Oakley Front Line MX goggle is designed to offer a wide peripheral view for maximum performance on track of in the trails. 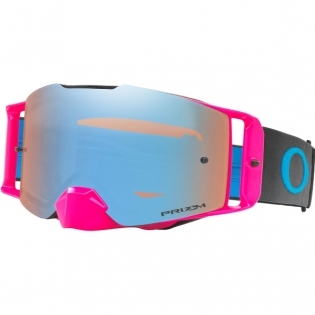 Equipped with Prizm lens technology, the goggles are designed to protect the rider in every way possible as they are faced with a constantly changing track environment. With a large to medium sized fit, the Front Line MX goggle has been optimised for a wide variety of faces and is engineered to fit perfectly with a majority of the helmets on the market today. 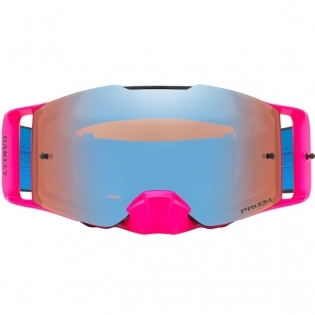 Originally launched for the snow environment, the Prizm lens might be the most important part of the Front Line MX goggle. Simply put, Prizm allows you to see colors more clearly. It filters light in a way that lowers transmission and leverages colour so as to offer the rider greater depth perception. 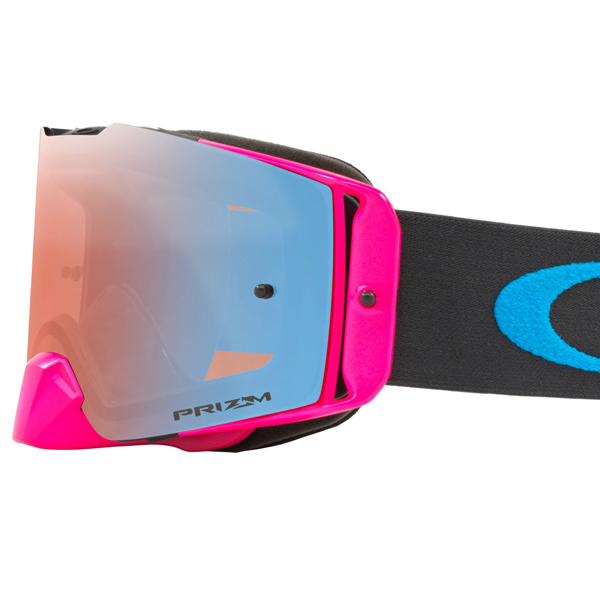 While the Prizm lens is a big part of the new Front Line goggles, it’s far from the only beneficial feature. Oakley’s design process is very similar to an automotive process. This attention to detail lends itself to greater fit and comfort for the athlete and superior control over any terrain. Oakley Front Line MX is the latest addition to Oakley's High Impact line of goggles. With a large to medium sized fit, Front Line MX is optimized for a wide variety of faces and is engineered to fit perfectly with most helmets. Designed with Oakley's Ridgelock Technology, changing lenses is quick and easy while still allowing for a complete lens seal to prevent harsh conditions from penetrating into your goggle. Discreet frame notches at temples provide compatibility with most prescription eyewear. 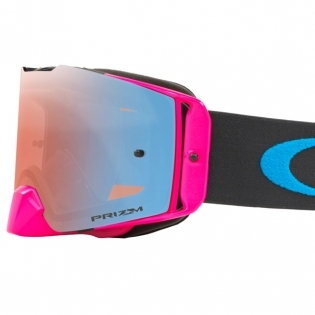 From the success of the Airbrake goggle the Front Line lens is also made of injection-molded Plutonite. That’s the most optically pure lens material ever utilized for MX goggles, and it’s insanely tough. Oakley Plutonite is the same ultra-tough material that shields the eyes of soldiers who can’t compromise on protection, and compared to the flimsy, flexible lenses found in other goggles, Front Line MX makes you invincible. Long gone are the days of struggling with installing lenses to adapt to changing weather conditions. With Oakley’s Ridgelock Technology, changing lenses is quick and easy, while still allowing for a complete lens seal to prevent moisture or dust into your goggle. Ridgelock allows for wide-open visibility and enabling a truly rimless lens aesthetic without any compromise to goggle performance. 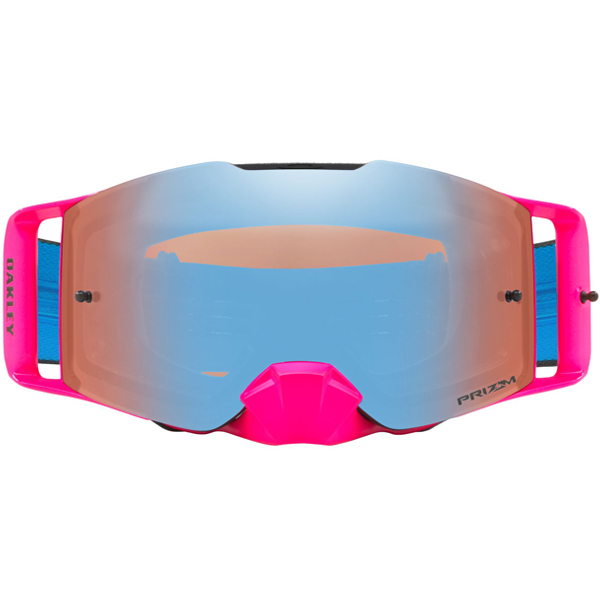 Airbrake™ MX and Front Line™ MX lenses are injection-molded under extreme pressure with high-impact Plutonite® to create a precise contour of optically correct geometry and clarity. Plutonite® is the most optically pure lens material ever utilised for MX goggles. When a rider is on the track, he needs to be aware of who might be challenging his position. That’s why this sleek design extends peripheral vision to the absolute max. Airbrake™ MX and Front Line™ MX precision lens curvature is matched with sleek frame architecture, expanding your feld of vision. Ultra-plush faceplate foam utilizes triple-layer construction to wick sweat off your face. Fleece layer draws liquid away from the skin and into the dual-density foam where capillary action moves moisture to the perimeter for quick evaporation. 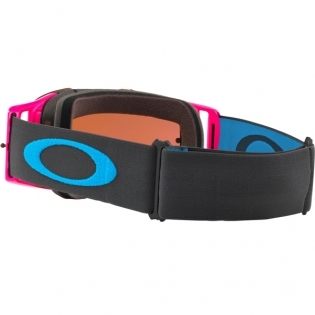 Oakley MX goggles offer the highest level of comfort and performance. Contoured frame architecture provides a continuous seal against dust and debris while eliminating pressure points and hot spots. The polymers in our thermoplastic urethane goggle chassis are formulated for high durability and controlled flexibility for improved safety during impact, as well as maintaining resistance to UV radiation, humidity, thermal shock and chemical exposure. Airbrake™ MX, Front Line™ MX and Crowbar® MX models feature rigid O Matter™ outrigger strap attachments that provide further enhancements in comfort and security.